stay in comfort". 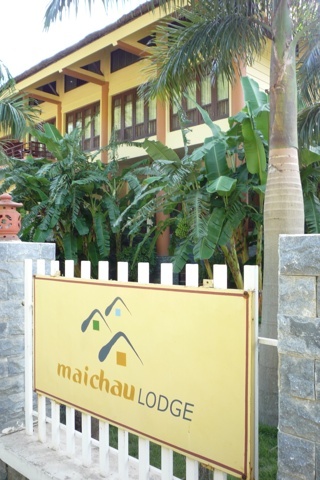 Now, the whole point of staying in Mai Chau is the ’homestay’ style experience you get in the villages, but some people don’t do homestays, and for about 20 times the price for two people, they will get the comfort they are looking for. Rooms are cramped and a bit past their best but are well-equipped and decorated with dark wood furnishings and brightly coloured ethnic style accessories. All have balconies with cafe tables -- get a room with pool view for the best views.. It’s a full service place: hand towel and welcome drink on arrival, free water and fruit in all the rooms, free internet, and even a small library with English language books. There’s also a small but pretty pool, sauna, steam room and (cold) Jacuzzi, and massages can be arranged. A basic buffet breakfast is included and tasty lunchtime and evening meals can be taken in the attractive restaurant. The bar/restaurant is also a good spot to enjoy a few happy hour drinks at sunset while overlooking the lily pond. It’s a good boutique resort but high season prices are on the high side: wait until the low season for good online deals – after all, you’ll have air-con and a pool in which to recover from the heat.